These are the things you want to be doing with this age group. This is the age to get serious about teaching baby to sleep in her bed if you haven’t already (and if that is a goal you have). See the CIO Bootcamp–Revised and Updated if you need help. You also want baby sleeping in her own bed if that is where you want her. It is also important and possible to have set bedtimes and regular naps each day. Baby takes two naps that are at least 1.5 hours long. Baby might also take a third nap, which can range from 30 minutes to 2 hours. Baby sleeps through the night. The first three main goals must be met before you can realistically hope for these two subgoals to be reached. Yes, some babies will reach one or both of these even if none of the first three are met; however, most will not in this age group. Some of you are going to have difficulty with number one. If so, be sure to look over the 45 minute intruder posts and the Naps: Troubleshooting post. Take the advice in those to heart, including the advice to relax about it all. If you are having short nap troubles, be sure to read through those for advice and encouragement. If you are having night issues, be sure to see the Nighttime Sleep Issues post. I have a 7 month old. He still takes that 3rd nap – 30 min to an hour everyday. When he eventually drops that 3rd nap, do I adjust the nap schedule? Right now he wakes at 6a so nap at 8-9:30 then nap at 11:30-1. I know it would be a nightmare trying to keep him happy and awake from 1-7 if he didnt have that 3rd nap. So how do you move naps back? I think the morning naptime works great but the afternoon nap will be moved to a later time. What time do you recommend? Brandy, from what I understood, they shouldnt need a middle of the night feeding once they are 5 months old. My baby has been sleeping through the night since 8 weeks old (6 hours, now 11 hours) but when he was 4 months old he had a week where he was waking up in the middle of the night and expecting feedings. I did it for a week, then was encouraged by my other mommy friends that I need to let him CIO. I wasnt a fan of that but I had to do it to regain my sanity! It only took one night and he stopped waking up to nurse. He learned that he needed to get all of his feedings and food during the day. Brandy, it is not normal for a baby on BW to be waking in the night at 7 months. She is definitely old enough to be going 10-12 hours at night without food so long as she is big enough. What I would do is start feeding her less at the 3 AM feed. If you bottle feed, offer fewer ounces. If you breastfeed, decrease the amount of time on one side until you get to feeding just one side and then decrease that side.But also look into other factors as to why she might be waking at 3 AM. My first guess would be maybe she is cold and just needs to be warmed up. Look at the "nighttime sleep issues revised and updated" post for a long list of possible reasons she might be waking in the night. Danise,I would guess it is a problem not really related to the third nap. I would guess she is teething or sick or something. See the post "5-8 month sleep disruptions" for a list of common reasons babies have sleep issues in this age range. This blog has become such a valuable tool in this wonderful world of mommy-hood. Thank you and to all the mom's that post…love being able to go to it on a weekly basis. So my question is regarding my 7 month old son: sleeps great at night (7pm-7am since 10 weeks), has napped great from 1 month to about 5 months (8am-11am and then 12pm-3pm…he had a cat nap from month 1 to 4 from 4pm-5pm), so overall a phenomenal sleeper. Recently (since about 6 months) his naps seemed to get cut short. He is a pacifier baby but can put it back in his mouth for the most part. Sometimes he rolls from his back to belly and can't get back over so I go in and turn him. Basically his schedule has changed so he goes down for about an hour and half in the morning and maybe 2 hours in the afternoon…is this typical for a 7 month old to change their nap schedule so rapidly? Should I just roll with the changes and anticipate that he'll take 2 naps for about 1.5 hours in the morning and then in the afternoon? The strange thing is that I usually go for an afternoon walk around 4pm-6pm (live in San Diego) and he will fall asleep at 4:45 to 5:30…so it is almost like he is reverting back to his 3rd nap! That isn't typical to change sleep habits at that age. Be sure there isn't a growth spurt. It could be the rolling thing interfering. He might also need his third nap back in the picture.There is a post on 5-8 month sleep disruptions, so be sure to check that one out. There are several common reasons for sleep disruptions at this age group in that post. I need help with my 8 month old's naps. He has been a BW baby since birth and has always been on a strict schedule. He is such a happy baby and loves the schedule. He started sleeping through the night at 3 months and now sleeps 8pm-7am with no problems. He has never been a good napper and I didn't help this by allowing him to take all his naps in his swing for several months. At 5 months old I started making him sleep in his crib for naps. It was a slow and painful process, but he now takes 2 naps in his crib a day – 9am and 1pm. He dropped his evening nap during this process. We do a naptime routine before each nap and I have been very consistent. He goes down well, but NEVER sleeps long. 30 minutes to an hour for both. There are rare occasions when he sleeps for an hour and half, but not much. I make him stay in his crib for at least an hour and 15 minutes each nap whether he is crying, playing or whatever. I thought doing this consistently would teach him to take longer naps, but it has not worked!Here is our schedule:7am Wake up/nurse8am Breakfast (cereal and fruit)9:15am NapHe usually sleeps about 30 mins to an hour 11am 5 oz bottle12pm Lunch (fruit and vegetable)1pm NapHe plays some then sleeps and then cries for 20-30 minutes and sometimes goes back to sleep.3pm nurse4pm Dinner (cereal and a veggie)7:30pm 7 oz bottle7:45pm Asleep for the nightAny advice on how to lengthen his naps? I feel like I have tried everything! He is crawling and pulling up now and uses so much energy during the day. I know he needs the naps!Thank you! Frances,Have you looked at the "Naps: Troubleshooting Revised and Updated" post? It will give you lots of ideas.I would start his first nap at 9 instead of 9:15.All other advice would be in that post. It might be residual "getting used" to sleeping in a bed rather than having a swing to keep him asleep. But you might try some white noise in his room if you don't do that. Cherwilson,If you do a four hour schedule, you will most likely have him up for two hours, then nap for two hours. So if you start at 8:30 AM, you would nap at 10:30 AM. Good luck! I have twin 6 month old boys–and I am having some issues that I cannot get over. One of my sons is having trouble with the 45 minute intruder for Naps–and I am just not sure how long to let him cry, etc. He eventually wakes up his brother–so it is frustrating on what to do with that. They both have Reflux–so I know that maybe once and a while they are having pain…but I can tell when they just wake up and are so tired–rubbing eyes and all–and just can't get back to sleep! They both sleep well at night now– from about 7-7 sometimes with a feed at about 3am still. Not many tears at night at all–just nap time is the hard part lately. I guess my questions are:1. how long should I let Noah cry when he wakes up after 45 minutes? (Do you think I should I put them in separate rooms to nap for a while?)2. I have to try to keep them on a schedule though the day or it is insanity–so what do I do when Noah wakes and I have to feed him? should I wake up his brother and feed him too (even though he is sleeping fine??)3. If that is the case–do I just adjust the "schedule" for the day? Still stick with the same bedtime though?Thank you so much!! 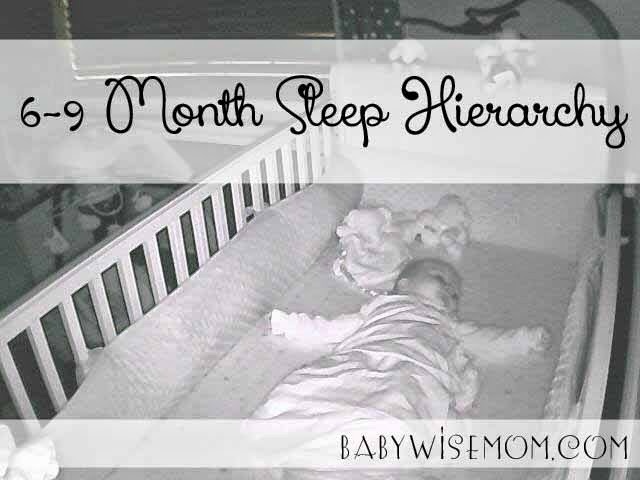 cherwilson,Some babies will start sleeping longer once on the four hour schedule, so it is worth a shot to see if that helps him. But he might also not be sleeping for other reasons. Is he able to self-soothe? Is he hot/cold? Is there some noise? Him waking in the night and taking short naps would tell me there is something that can be changed–there really are a lot of possibilities. Check out the "nigthtime sleep issues" and the "naps: troublshooting" posts for ideas. Good luck! Jenae, if they will sleep separately, that might be a good idea to separate them. I haven't ever done CIO mid-nap–the best thing is to go with your personal judgement. Two is hard. I have several close friends with twins. One says twins are hard because if one is a bad sleeper, both are bad sleepers because you have to wake the other.However, if you can, I might stagger and let the good sleeper sleep while figuring out Noah. I think that is what I would do. I would hate to train the other baby to not sleep well. Another friend of mine lets the sleeper sleep.You might need to consider proper waketime length for Noah. He might need shorter or longer waketime than his brother. Best of luck! I have been struggling to follow BW since day 1 b/c my daughter refuses to sleep more than 30-45 min at a time. She is now 7 months old and takes 3, 30-45min per day. She doesn't wake up crying, she is typically always happy after just 30 or 45 min of sleep. She has congenital hypothyroidism, so I know the synthetic hormone she is on could be affecting her sleeping/eating patterns. She has slept through the night since 10 weeks old. Bedtime is usually 7:30-8pm (but it usually takes her 30 min to fall asleep), waketime is 7:30am. Sometimes she wakes in the night for up to an hour. Because of her nap problems, we have basically just trained her metabolism to eat every 3.5hrs, regardless of when she wakes from her nap. Consequently, she often takes a bottle and then is ready for a nap, which is a reversal of the eat,wake,sleep cycle. Even if i just leave her in her crib after she wakes from the 30 or 45 min nap she will just talk to herself/whine/play until it is time to eat…but often that is an hour or 1.5hrs from the time she wakes. The inconsistency makes our schedule so unpredictable and it is killing me. I have tried everything but I can't make her sleep and like I said she is usually happy. She can only stay awake 2-2.5hrs at a time right now. I have no idea how to possibly transition to 2 naps per day, but I'm wondering if she will sleep longer if she only takes 2 naps instead of 3 naps. But, her 2nd nap is usually from 12:30pm to 1:15pm so I know she can't stay awake until bedtime. Do you have any suggestions whatsoever? Jenna, see the post "Chronic 45 Minute Naps : http://babywisemom.blogspot.com/2008/09/chronic-45-minute-naps.html "Some people find that on a 4 hour schedule, the child sleeps better, so you can try that if you want to. But if she has something external affecting her sleep, I would be prepared to accept the 45 minute situation for now. Good luck! Erin, I would first put effort into seeing if you can get more calories in her during the day. If she is waking from hunger, CIO won't help. Hello,I could really use some help! I have been doing BW since my son was born and everything was going GREAT, just as the book said, until a month and a half ago. He was 8 1/2 months old, and something went haywire. He got 3 teeth in during that time, so maybe that got us off course, but I have not been able to get him back on since. He used to sleep 8pm to 7, taking 1 1/2 to 2 hour naps at the right times. Now he wakes up early, between 5am and 6:30, and is still obviously tired. No matter how long I leave him in his bed, he stays awake, crying. That can throw off the rest of our day with when he gets tired. I've tried starting earlier bedtimes, feeding more, changing nap times…everything. Now he is screaming for up to an hour when I put him down for naps, or not sleeping at all. 🙁 Everything is gone crazy and I have no idea how to get him back on. I miss my happy, good natured baby very much. Please help! I may have possibly come up with the answer—it just took me a month and half! I had my son sleep elevated last night because he was congested and coughing a lot, and he had the BEST sleep he'd had since this all started. His naps were excellent sleeping in the same position. Then it dawned on me–his doctor took him off acid reflux medicine the week before this all started. So sleeping elevated possibly prevented the acid from coming up as bad. I called his doctor and told her what was going on, and she agreed he should go back on the meds. I am so hopeful this is the answer, and just kicking myself I didn't realize the timing of it all quicker. I just assumed it was the teeth coming in that initially caused the drama. I really hope this works! LLC, I am so glad you go it figured out! Next time something like this happens, I always say to try to think of everything that changed when things went bad. Good job figuring it out! Hi Valerie! I am at a loss with my 7 month old son. He is my third and i did BW with all of them. I have been using your blog since baby 2 and usually can always troubleshoot by just reading. But with my son i have tired EVERYTHING and feeling incredibly discouraged and exhausted. So i thought i would write and see if perhaps you could bring some insight. My son has never been the perfect BW baby. my first two pretty much took to it like a charm. He has done pretty good but constantly dealing with inconsistencies. I usually would just problem solve (find out whats changed and so on) and that would normally fix it. We recently moved from our home into a couple different temporary housing (i.e friends home, in laws) before we could move into our home. (Due to closing dates) i suspect this may be the culprit that started our downward spiral. Before we moved he was pretty much sleeping 7pm-5:30-6am. (we dropped the dreamfeed at 5months. It was causing disruptions in his sleep so i finally dropped it. we stuck to our routine as much as we could but he def wasn't doing as well in the temporary living places as before we moved. To be excepted i guess. We have been in our new home for 3 weeks. It has been tough. He has started waking habitually at 11pm, 4am, 5am every night. I also want to add that he has advanced rather quickly in his motor skills. He started crawling at 6.5 months and is now pulling up to standing and starting to make his way to cruising at 7 months (which i also suspect as part of the disruption) and on top of that he has been teething for what seems like 2 months. His bottom 2 teeth came in before we moved and now his top 2 are breaking through. I give him pain relief almost every night and teething tablets during the day. i read the article on the wonder weeks and also think this could def have something to do with the disruptions. He has been moving himself to a 4 hr schedule (i never take the lead i always let them do it) and eating solids 2-3 times a day. he dropped his 3rd nap on his own too. so we are down to 2 naps usually about 1 hr 15 min each.I don;t think its a growth spurt (he's having great bowl movements and not taking in anymore than usual…if anything he seems less interested in nursing. (he will still nurse but not as long and is ready to get off me and crawl) We have tried CIO at night..to try and break the habit (which he will cry for an 1-2 hrs if we let him). He has responded better to the Baby Whisper method of going in picking up, putting back down.He will get quiet for about 30-45min…but it doesn't stop…he just keeps doing it. I have startred Bf one side just to comfort him and get him to go back to sleep. Which sometime works/sometimes doesn't. So here is my current nighttime schedule that i so desperately want changed. 7pm bedtime11-11;30 wakes crying…(we paci…have always used a paci with him and all my kids…does not seems to be a disruption ) Last night i actually BF one side because i was exhausted and i could tell he wasn't going to stop. He had cried for 45 min so im not sure if it was that he needed to nurse of it was just comfort)4am, wake, he cries off and on till 5am (Sometimes i offer one side…he doesnt usually want it6am wake, nurse (He does take a full side and is ready t go bac kto sleep if he didn't nurse at 4. back to sleep till 7:30-8He will barely nurse at his morning time feeding…obviously since hes been snacking all night.there has been maybe 3 or 4 nights that he has had "goodnights" that usually looks like 7pm bedtime, wakes between 5-6am, nurses, back to sleep till 7. and thats a good night these days. Val, I'm writing out of pure desperation! My 7.5 month old will not nap past 30-45 mins! We feel like we've tried everything. He's been on the BW schedule since birth and can put himself to sleep beautifully and sleeps all night 11-12 hrs. I finally got to the point where I tried set nap times of 9:00 am and 1 pm with a catnap around 4:30/5. And I left him in the crib to CIO if he woke early (which was pretty much every time). He did put himself back to sleep a couple times but usually for only 15 min. Then after reading baby whisper forum I thought maybe he needed a waketime increase in the AM so I stretched him to 915/925 and got an hour nap. Thought I was on the right track, NOPE next day back to his old ways. He wakes happy most of the time in the morning but not from the next nap as he's then OT. I'm worrying myself absolutely sick over naps! I feel like I'm never going to get a good nap out of him. Please help!!!! Here is our EASY from the last couple days.6:45 WU (plays in crib)7:00 eat8:00 solids9:15-10:00 nap11:30 eat12:00 solids12:15/30 nap (slept 30 min)3:00 eat3:10 (fussed/played till 3:30) up at 3:564:45 eat solids6:30 bath645bottle/bedtimeHe does take a paci and will sleep longer if it doesn't fall out after falling asleep so I'm wondering if it's time to break the paci habit! His room is very dark, and we use white noise. Hi Val!! We just dropped the 4th nap for my 6th month old and working towards a 3.5 hour routine. I am having a hard time w/ the dinner part of the day. At the sitters he gets a bottle of BM after his 3rd nap anywhere between 315-4pm. Then he gets picked up and we're home by 5pm. We used to have him sleep from 6-7 but recently he's been taking forever to fall asleep for it and I thought by 6 months the 4th nap should be gone? Before dropping that nap, we would have him drink a bottle and eat his baby food at 700-715 and then put him down for bed awake at 8 and he did good. But w/o that nap, he gets really fussy between 6 and 7. Do I do a bottle at 330-4, then solids around 6-630 and then his last bottle before bed at 745? We never put him to bed w/ a bottle right before so this would be new. Or can I actually feed him a bottle at 7, along w/ solids, followed by some awake time and still put up to bed at 745-8? Just thought it would be weird feeding him dinner w/in the same hour as bedtime. I did baby wise for my 1st son too but we did his schedule a little different since I worked different hours. Help! I'm pretty tired and I need help 🙂 My bundle of joy is almost 28 weeks old, wakes at least once during the night and has been waking up to 1.5 hours before DWT. Problem 1–Night Wakings: He wakes crying (smaller, building up to louder), I've had little success with trying to soothe him with holding or shush/patting, he definitely doesn't go back to sleep on his own, I can't do CIO (hubby isn't into it), and I don't use a pacifier. Instead I nurse, he eats well, and then he goes right back to sleep. I've tried giving him a bit less to eat but he cries. I don't think he should be doing this at his ripe old age and he's STTN in the past. He wakes at completely random times and usually only once but last night it was twice. Problem 2–Early Morning Wakings: He wakes happy (all other wakings from sleep for naps, etc are crying), talks to himself for approx 30 minutes, gets bored (I think), and starts crying. This could occur anytime after 5am. I know he's still tired so lately I've been nursing him and he falls asleep again at least for a little while. Really though, he thinks he's waking for the day at 5:20 am.Schedule:7a DWT (ha), nurse830 nap1030 wake, nurse1230 nap230 wake, nurse430 nap515 wake, nurse700 bedtime routine including nursing again730 sleepHe usually goes down well for all naps and I have to wake him (except maybe the 3rd nap). I tried shortening the 3rd nap from 60 min to 45 min for a few days but no change. Might be messed up because he's OT from early morning waking though. I just started giving solids 2 days ago so right now he only eats them once a day (afternoon or early evening). Yesterday he had solids at about 6pm, ate a good bit, nursed at 720, nursed at 12am, nursed at 3am, and woke for the day at 520!!!!! Any suggestions are immensely appreciated. Oh also he still sleeps in our room because he's on oxygen and there's an alarm that goes off multiple times during the night (aka I don't want to have to walk to another room to check him). Double also, we are meeting your 3 main sleep hierarchy goals and your 1st subgoal. Thanks!!! My 8 month old daughter was STTN until a vacation 6 weeks ago that messed everything up. Since then, she's waking once or twice at night not going to sleep until I feed her, then she is happy and goes back to sleep. She is also waking at 5:30 when wake up time should be 6:15. She goes to bed a 7 pm. I've been searching the book and blog for weeks and I've been making sure to feed her more and she's getting two naps of 1.5 to 2 hrs a day, I'm making sure she gets quality mommy, daddy time, and independent play. CIO hasn't worked because she just keeps waking up and crying again after 2 minutes or so once she falls asleep. She's breastfeeding with solids and 2 BM bottles a day. Any suggestions? New to this! I had a detailed post but lost it. Anyway, at a loss with my 7 month old. She started STTN at 10 weeks from 8:15-7/7:30. At five months we had to transition out of the swaddle into a zippy as she was rolling in it. Since that time she has STTN until 7 am maybe five times. We have random night wakings and more frequently early wakings at about 6. I have resorted to putting her in the swing the past two nights as a 6am wake up time doesn't work too well. She will fall back asleep in the swing. I have switched to a four hour schedule with a hit or miss catnap, earlier bedtime (about 7:45pm), I don't Rush in in the MOTN, whether or not she gets that catnap makes no difference at night. The other two naps are ok with the exception of her not sleeping this morning nap. We have been through a growth spurt, teething (3 teeth), short vacation (sleep away from home was no different), less naps, I've scoured your blog…no change. The only way I get her to sleep til 7 is in the swing, but obviously I don't want to rely on this. Help! I would say it is one of a few things:1-she isn't ready to sleep well without being swaddled2-she doesn't like the zippy 3-her body temperature has changed with the new sleeping set up and she isn't sleeping as well. Think what you think it could be and see how you can address that. If it is the swaddle and you don't want her swaddled, it will be s wait it out situation until she can sleep well not swaddled. Good luck! I love this site! The baby wise books are amazing, but definitely leave a lot of gray areas. This site helps fill in all the blanks and I am super grateful! Just looking for some schedule advise. My daughter is 8 months and still taking 4 naps a day (duration is usually 1.5-2 hrs). I do not think this is an issue because she is sleeping through the night fine. However, she is still on a 3.5 hrs feeding schedule which I would really like to see stretch to 4 hrs. Sometimes she will make it the 4 hours between feelings, but that's if i don't feed her until about 30min after she wakes up from a nap which throws off the feed, wake, sleep cycle. Also, when she gets tired it comes over her all of the sudden and is very obvious. I have was going to try extending her wake times just a little bit, but I can see she truly needs a nap so I don't think that's best. Please let me know what you think and any areas that could be adjusted to help. Here is a sample of her schedule:6:30am bottle, solids (down for a nap 8am)10:00am bottle (down for a nap 11:30am)1:30 bottle, solids (down for a nap 3:30pm)5:30pm bottle, solids (catnap around 6:30pm)7:30pm bottle and down for the nightI'm open to any suggestions! Thanks! Hi Val:Thanks for this site. It's been so helpful for me over the past 6 months. I have a baby that has been challenging from day 1 to get into perfect babywise schedule. However we have done our best to make it work. Recently – she's almost 7 months – things have started to spiral. She's waking earlier and earlier every day. Her wake time is usually 630 but then she started waking at 6 and then 545, 530 and this morning was 5. She still is waking once in the middle of the night to eat and occasionally 2x! I tried to let her CIO but she's most difficult. It ends up actually fully waking her and then she won't settle for hours. I think she is legit hungry so. I'm trying to get her more food during the day. Because her wake time isn't consistent, her day schedule isn't consistent. I'm finding it impossible to get her on a 4 hour schedule, etc. The only consistent thing right now is her bedtime – 7p. Her naps are about 3.5-4 hours total and I don't let her sleep past 530. Any thoughts on why the progressively earlier time?